I went with Geo_ & Rose to hear Rev (illegible) lecture on "True Greatness" at M.E. church this eve. May 6 Tuesday Pleasant & less wind, but cold in morning, having quite a frost we hear about us, tho' we weren't up early enough to see much of it. 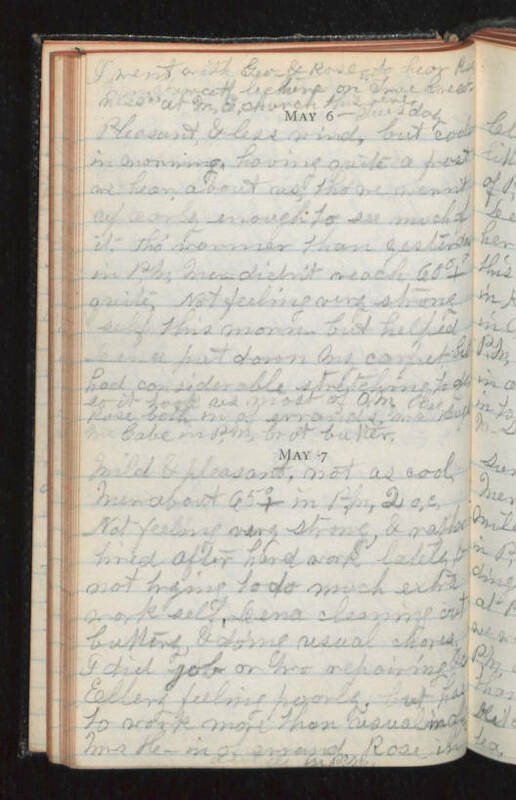 Tho' warmer than yesterday in P.M. Mer didn't reach 60°+ quite, Not feeling very strong self this morn but helped Lena put down my carpet but had considerable stretching to do so it took us most of A.M. Geo & Rose both in of errands, Mrs. Hugh McCabe in P.M. bro't butter. May 7 Mild & pleasant, not as cool, Mer about 65°+ in P.M. 2 o,c, Not feeling very strong, & rather tired after hard work lately & not trying to do much extra work self. Lena cleaning out buttery, & doing usual chores. I did job on (illegible) repairing (illegible). Ellery feeling poorly, but has to work more than usual in day. Mrs H_ in of errand, Rose in awhile in P.M.